You are here: Home / Try Curious Blog / Girl Scouts / An Idea. I wont lie to you; this did not start out innocently. This, like many successful things that exist in our society at present, started out as a joke-slash-dare-slash-get-rich-quick scheme. There is also Gertie, the sewing enthusiast and vintage clothing lover who blogged her way through the tedious effort of making most of the garments from the 1952 “Vogue’s New Book for Better Sewing”. Her blog also procured a substantial number of avid readers, which eventually led to her publishing not one but two books (the second to be published next year), both instructional texts with gorgeous patterns for Gertie’s take on some of Vogue’s most iconoclastic ensembles. There’s the guy who started a tumblr blog chronicling the misadventures of his toddler son who, regardless of the circumstances (or perhaps in spite of them), is always, always crying. I assume that his new book, “Reasons My Son is Crying”, will be stocked on all the shelves of Urban Outfitters just in time for Christmas, right next to “Sh*it My Dad Says”, another project which began as a twitter feed and was magically transformed into a book deal even before the twitter account gained over 3 million followers. 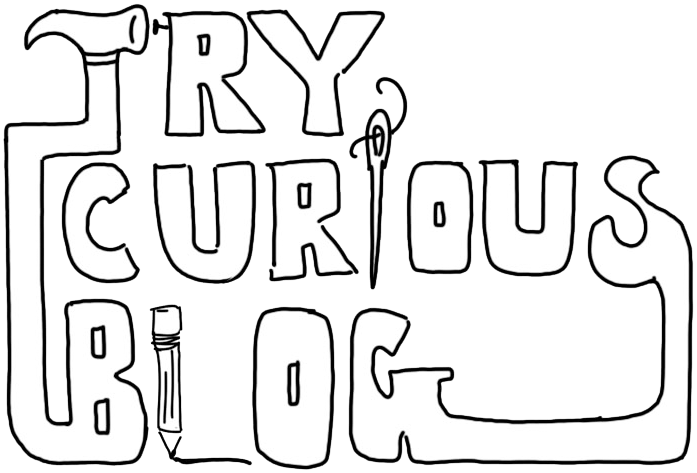 The list of blog turned books goes on and on: “Stuff White People Like”, which is pretty self explanatory (and which consequently serves as more race-inspired fodder for me to agonize over (“Am I too white? Not white enough?! WHAT DOES IT MEAN THAT MY MOM DOESN’T LIKE ANY OF THESE THINGS!?! !”), “I Can Has A Cheezburger?”, a collection of internet memes starring barely literate cats, “This Is Why You’re Fat”, a blog-turned-book of pictures showing ridiculously unhealthy edible concoctions (all of which I would have eaten ate in college), and “The Joys of Engrish”, an astoundingly racist publication that makes fun of English translations from mostly Asian languages (for the record, I get the general joke, and I can see the humor in cultural misunderstandings based on dialect and language, but devoting an entire book to this subject matter is just another example of elitism; it seems unfair to poke fun of a specific group of people without turning the finger around on ourselves, in which case it just turns into bullying for profit. Which I suppose is the American way. But I digress). As a consumer, experiencing the initial shift in the publishing market was notable, but it also seemed understandable when compared with the state of other media outlets, specifically TV. A small handful of reality shows that were originally groundbreaking and inventive had been saturated by networks wanting to create more revenue, in turn casting participants willing to do any and everything to have their 15 minutes (sometimes, sadly, an hour) of fame. So the first few brilliant seasons of MTV’s The Real World begot Big Brother, which begot Survivor, and then a bunch of weird, unintelligible stuff happened behind closed doors, and we ended up with Long Island Medium and that show about the Amish gang members. The same thing, on a smaller scale, seems to be happening with books. You don’t really have to write about anything NEW now; you only have to take an idea that someone else came up with it and do it again, or talk about it, or mimic it, or do it wrong, or gather a collection of things that someone else has done that you have witnessed, and package it up nice and neatly. Outside of fiction books, there doesn’t seem to be a whole lot of original content being generated. I actually don’t think this is all bad. I am a proud lover of DIY, and any book, website, blog or tutorial that can lay out, in easy, understandable terms, how to do something that I didn’t know how to do before is right up my alley. I have purchased (and benefited greatly from) a few of these books that began as blogs; “Gertie’s New Book for Better Sewing” has added several gorgeous items of handmade clothing to my closet and taught me all kinds of fascinating haute couture and alteration techniques that I never used in my previous sewing projects. Obviously Gertie didn’t create the techniques used in the original Vogue publication, but she translated the language into something comprehensible, giving readers like me a brand new appreciation for vintage design. And Ana White’s book “The Handbuilt Home” which began as a blog to detail her journey in teaching herself the art of woodworking, inspired me to start building my own furniture. Ana White of course didn’t invent the hammer or the nail, but she provided an example of a capable woman using power tools and lumber to construct functional and beautiful furniture for her home, and reading her book made me want to be just as accomplished. And now I am. Several years ago my online comic “High Yella Magic” received the attention of some reputable publishers and literary agents. Although I had never seriously thought of turning my comic into a book because I was still figuring out my style and learning how to draw and write stories proficiently, the idea appealed to me, and I took a couple of meetings to discuss the comic’s potential. I was pretty astonished to find out how sleazy the publishing field could be. The agent I met with told me in no uncertain terms that my stories, which were all honest retellings of my own experiences, needed to focus either on the fact that I was a biracial woman of color, or that I was queer. She told me I couldn’t write about both, because those two demographics were incompatible, too exclusive, impractical. Maybe she was referring more to money, rationalizing that the group of readers my stories would attract was not big enough to capitalize on. But that’s not what I heard from her. I am not here. My stories don’t matter, therefore I didn’t matter. I sat before her with several sheets of expensive card-stock paper onto which I had meticulously penciled, drawn, erased, sketched, penned and lettered over many, many hours the details of some of the most memorable events of my life. And with a quick toss of her hair, this agent told me that I needed to pick a side of who I was, and try and sell that, but not both sides. Not the actual truth. Just a thin version of the truth. I walked out of the agency feeling a little numb and a little relieved. I felt like I had dodged a bullet. Because I don’t want to pick and choose the aspects of myself that seem profitable in order to get a book deal. Because my skin is brown and because my partner is a woman and because both of those things define me, neither of them completely, but neither without the other. Because being brown and being queer to me are valuable. Because who cares about a book deal when you have websites and blogs where you can essentially “publish” anything you want to anyone who cares to read it? So like I said, this did not start out innocently. I had some history. What would it take, I wondered, if not a decently written documentation of an interesting life lived, to get a book published? Well, a blog of course! At first my partner and I just brainstormed to come up with the most ridiculous ideas that what would attract the biggest audience. “I want to start a blog about __________ so that I can get a book deal and a movie deal starring the most prolific actors of our time”. Gardening with a black thumb; one woman’s attempt to defy her murderous hands. (cast: the brilliant actor who plays Michonne from Walking Dead as the protagonist AND the plant). How To Renovate An Old Home With Absolutely And Unequivocably No Understanding Of How To Renovate An Old Home (Viola Davis, maybe?). Our joke got old, and was mostly forgotten, until one day we were with some friends outside in the backyard looking at the night sky and talking about our childhoods. The major theme of my youth was the fact that I grew up poor and biracial in a mostly white, mostly wealthy southern town. The things that my partner and so many of my friends took for granted as kids, things like taking dance classes and going to camp and bringing their own lunch to school and learning piano, were things that I coveted, things that I STILL covet. I wanted nothing more than to spend my time after school learning ballet techniques in front of a mirror, making new friends from new places, not having to announce to the cashier that I qualified for a reduced-price lunch in the cafeteria every single day (she either had short term memory loss or took some sick pleasure in making me say those dreaded words out loud day after day). Instead I came home from school alone every afternoon and watched “Square One” on PBS, waiting for my Mom to get home from the hair salon where she worked. I supplemented my boredom by writing commercial jingles accompanied by my electric ORGAN, which I did not know how to play. I wanted to learn how to play a keyboard and instead I got an instructional pamphlet with a heavy 16-key organ that sounded like the longest, softest fart when you played a note. That’s all my Mom could afford, and I didn’t complain. That night in the backyard, the subject of Girl Scouts came up. Unlike most adults, I don’t equate Girl Scouts with cookies at all; I sometimes forget that cookies are even a part of the organization. All I think about when I hear the words Girl Scout is how much I wanted to be a Scout when I was a kid. I always imagined that I would have excelled in it. I was a painfully polite little girl, eager to listen and eager to learn, enthused by the idea of community and leadership and thirsty for a chance to show off my talents to anyone who would appreciate them, even though I did not know the extent of my talents because I didn’t have many opportunities to explore them, at least not with the guidance of others. But my Mom couldn’t afford those things and I, of course, never complained. I remember going to day camp in the park during the summer when school was out, an expense my Mom struggled to pay for only because I was too young to stay home by myself. The Girl Scouts had come to the park to see if any of the day camp kids wanted to sign up to become a part of the organization, and they handed us a sheet of paper with contact information that mapped out everything the Girl Scouts would learn and achieve as members of the group. My heart beat fast as I imagined all the fun things I would get to do because of my involvement with the organization, all the badges I would get to wear and show off, which I only knew about because I saw it in a movie once. But then I read the included price breakdown for uniforms, badges, materials and activities required of all the Scouts. I squashed my hope down real quick. That evening I handed my mom the sheet of paper with my eyes downcast and no hint of expectation in my face. I knew we couldn’t afford it. My Mom read over the information and commented on how it was so ridiculous that something like this should cost so much money (to be fair, anything that didn’t have a layaway option was considered expensive to my single parent mother), and eventually the paper found a home amidst others on our dining room table, covered in coffee rings and crumbs. “I think I would make a fantastic Girl Scout” I joked to my friends, and they all nodded in agreement. Who else did they know who exhibited so much enthusiasm for learning new things, whose instagram page was overflowing with images of homemade marshmallows and handmade quilts? I asked, “What else do Girl Scouts do, besides make things? What do those badges mean?”, but no one knew the answer. They, unlike myself, had not wanted to be Girl Scouts when they were younger. Maybe they had schedules too jam-packed with soccer practices and guitar lessons to have room for Girl Scouts. Maybe the good deeds and volunteer work required by the Scouts was uninteresting to them. Maybe they weren’t Girl Scout material, not like me. But then again, I had no idea what the Girl Scouts actually did, so I wasn’t quite sure if I really WAS Girl Scout material or if I just wanted to BE Girl Scout material. I laughed, but only for a moment, as I slowly realized that, unlike “Gardening with a Black Thumb”, I was actually kind of serious about this idea. The book part of the concept was the silly part, the part meant to illicit laughter and an eye-roll, but the blog part, the part where I really do learn and then write about what it means to be a Girl Scout and examine, publicly, how to navigate the gap between being a little girl who wants things she cannot have and a woman who has things she doesn’t need? That part was for real. Would I make a good Girl Scout now, as an adult? Would I have made a good Girl Scout way back then, as a kid? Will it be easy now with all I have learned and experienced as a grown woman, or will it be more difficult? Where will I fit in as a queer woman of color emulating the ideals of an organization that has always poised itself in my mind to be mostly white and almost always straight? Are Girl Scouts even still relevant today, given our current environment which seems to prize individuality and uniqueness rather than community-driven work and citizenry? These are all absolutely genuine questions that I want to know the answers to, and since I don’t have a daughter that I can force to join on my behalf, I think I am just going to have to figure it out for myself. Of course, I could figure all of this out for myself BY myself. If this is all about personal growth, about relearning and revising the ideas I have about who I am vs who I was under the guise of “becoming” a Girl Scout, why not just do it on my own? Why blog about it? Why share it with anyone on the internet at all? I think I have to do it this way because my story does matter. Because there are not enough voices like mine in the world that are ever heard, and I can’t complain about the lack of representation that exists in the world if I am not willing to add perspective to the mix. I exist, and other people just like me exist, and it doesn’t matter how we share our stories, whether they are on TV or in books or in comics or in stories told by friends outside at night in the backyard. It just matters that they are heard. 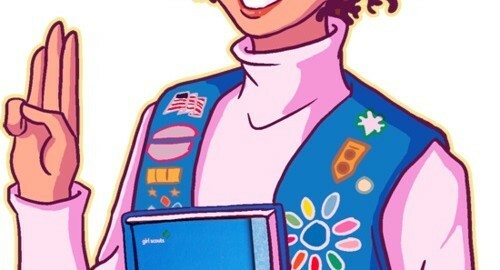 Despite the (embarrassing) breadth of this blog post, I am not actually committing myself to “becoming” a Girl Scout just yet. I still have a bit to learn about being a Girl Scout, and I have to see if it’s even something that is doable for me as a 33 year old woman operating rogue, since I am unsure of how big a role the Scout leader plays in moving up the ranks. 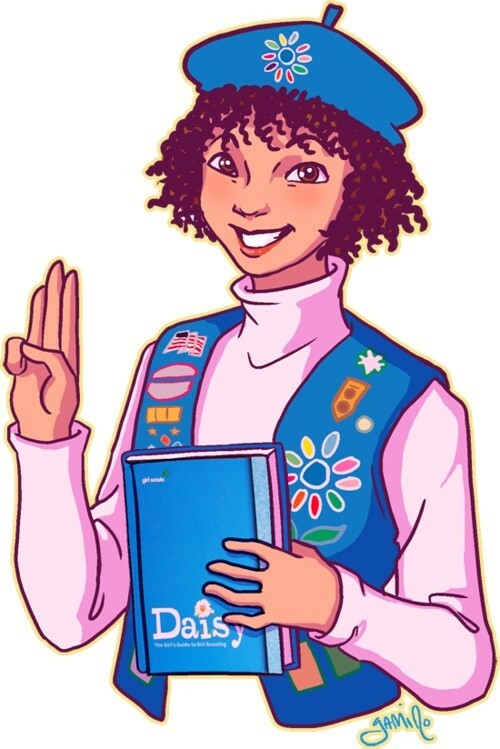 My fantasy of being a Girl Scout simply requires me to make some brownies and be nice to people for a few of months, and then I imagine that I will move up the ladder from Daisy Scout to…well, whatever type of Scout is next (Brownie, I think? Oh, how fitting! ), and then I will get a bunch of badges, and then I will have learned a bunch of life lessons! Or not. I don’t really know what I am expecting to happen. But I want it to be genuine. If it isn’t serving me, if it ceases to be fun or interesting, then I won’t move forward with it. I have better things to do with my time than work on something that has lost it’s luster. But right now, I am intrigued. At it’s best, this is an opportunity for a grown woman to make one of her childhood wishes come true. One major difference between Grown Jasika and Girl Jasika is that I went to the Girl Scouts of America webpage last night to see what materials were required to begin the process of becoming a Daisy Scout, and upon discovering that “The Daisy Girl’s Guide to Girl Scouting” handbook, a requirement for all girls interested in becoming a Scout, cost $22.50, I didn’t lower my eyes and feel ashamed. I bought the damn book. Because I can afford it. http://jasikanicole.com/wordpress/wp-content/uploads/2013/09/GirlScoutJasikabyyamino.jpg 749 500 Jasika Nicole http://jasikanicole.com/wordpress/wp-content/uploads/2013/08/logo_green-300x78.jpg Jasika Nicole2013-09-11 17:51:542013-09-24 13:55:52An Idea. I WAS in Girl Scouts for many years, and it was many different things to me throughout those years. We did badges and focused a lot on community service. I learned a lot about my local area’s history through my Girl Scout’s program. I learned the basics of a lot of different arts and crafts, which helped me to pick things back up as an adult (i.e. doing cross-stitch bookmarks as a kid meant I could pick up a simple pattern and mostly figure it out). As we got older and the troop dwindled, it was a lot more about the camping and going to Girl Scout camp, which was always great, with rock-climbing and ropes courses. AND Girl Scouts is very accepting of queer people! I don’t know what their policies were when I was a kid, but now they do have a policy that basically states that they accept any child who identifies as a girl. I never had a problem being out as lesbian/bisexual (depending on how I was identifying at the time… oh, high school confusion!) at events or camp, and I graduated high school in 2004 so this was some time ago. This is so great, Jasika. I think it is a really great idea. And I love how strongly you try to stand with the rest of us women who are brown and queer and valuable. I think your idea is super rad, and if you wind up going through with it, I will support you with my readership and my affection the whole way. I think this is fantastic! I wish you the best of luck and hope to see/hear more about your journey. As an adult Girl Scout, I am very encouraged by you and your thoughts on this organization. My daughter is now 16 and she has been a scout since she was 5. I have been fortunate enough to be there with her every step of the way. We leave in a predominately white community but one of the things I have loved most about scouts is the diversity it brings to children and to see their openness and willingness to learn about people that may not look as they do. To see them treat all people with respect. We have always had focus on community service but especially now that they are older it is their main focus. I’m sure if you would have been a scout when you were a child you would have been great. But I think with the creativity you have and your obvious leadership skills, that you would make an excellent adult Girl Scout. Girls need someone they can look up to, and it is something they want. I hope the journey takes you some place special and that you will impact the world in way you never imagined. Why the hell not!! I have no idea what scouts do and mostly I never wanted to be one. But I relate to the free/reduced lunch plastic card with the hole punched to tell everyone I didn’t pay full price. I remember wishing I could take advantage of off campus lunch in HS and buy lunch somewhere! I think my Girl Scouts was clothes bought in a store not out of a black garbage bag that mom hauled in from co workers…the 2nd part of that story is the chubby girl that never had clothes that fit quite right. My fantasies included going to a store where things fit me and i looked good in them. Anyway – this is YOUr blog but it struck a chord. Im saying theres a universality to the theme you are hitting on here. In some ways I think all f us have a Girl Scout that somehow we were shut out of. It’s really sad that someone with so much talent and energy wasn’t afforded the opportunity to pursue it. How many young people are going through that right now? I’m glad you are going for it – I look forward to learning what the hell a brownie is anyway! You are special and unique and I want to hear what you have to say. However it happens, I want to be invited to all of your badge ceremonies and graduations to the next level in the Girl Scouts. I really enjoyed reading that, beautifully engaging and articulate. I was a Brownie. We didn’t have much money either as a kid. 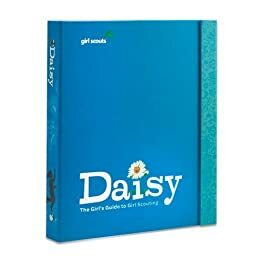 I didn’t want to burden my mum with the cost of becoming a Girl Guide so I pretended that I didn’t want to go to Guides when I was 12 like my friends did. Oh to toast marshmellows over an open fire while sitting in front of a tent that I put up! oh the simple dreams of a small town girl that lay to waste. I still have the 6 little badges that I got in Brownies. One was a writer’s badge. I’m secretly very proud of that! Best wished in your Grown up girl becomes a Girl Guide adventure. Please eat a toasted marshmellow for me. This is such a great idea! I was in Girl Scouts for most of elementary school (until my troop disbanded as girls found other interests and activities) and I have such fond memories of those days. We did a lot of community service type-stuff; visiting the nursing home near school, helping at the food bank, doing cleanups along nature trails, that sort of thing. And lots of arts and crafts and camping as well! I can cook so many different things over a campfire, you have no idea. I can’t wait to read all about your journey! You’ve made me want to dig out my old handbook and badge book and do some of the badge activities as well! I think you will make a most excellent girl scout! Good luck! When you cross over the bridge, make sure to let us all know so we can sing “Make New Friends” together. I love this idea. I often ponder about how each person who was once a young child who didn’t have all the things other kids had holds in their mind a special Thing that will indicate to them that they have MADE IT. For my boyfriend, it’s never over-diluting the frozen orange juice. For me its real leather boots, or things with my name on them. My name! RIGHT ON THE THING! These are our “One Day When I Am Rich” indicators. I love the idea of investigating the Girl Scouts, revisiting your youth and learning more as an adult, and doing all of this is public! It’s whimsical, wise, and brave. And the whole “you have to write about being a Person of Color, or you have to write about being queer, but not both,” reminds me of the author Samuel R. Delany, who said that as a black, queer, science fiction writer, he was three times an outsider, three times a minority. The idea that you have to frame yourself and your stories to fit a particular demographic is just utterly dehumanizing and gross. My wife’s a scout leader, and she was only able to do that because the Girl Scouts now waive fees for people who can’t afford it. And it’s all based on the honor system; all someone has to do is contact the district office and tell one person (the district coordinator) that they can’t afford it, and it’s all covered, no questions asked. And, because of that, both her and my daughter were able to join. And my wife’s troop was able to start up, which covers our local elementary — the only minority-majority school in town. I know it would’ve been nice to have this back when you were growing up, but GSA are doing things better, now, from what I can see. This is a great idea, and I’d love to read about it. I’ve been thinking about the Girl Scouts recently and wishing I’d been more involved as a kid– I joined twice, briefly in both first and fifth grades, but our local troop leaders weren’t terribly involved, so the meetings were pretty dull and I stopped going. I’ve thought about getting involved as an adult, but I’m not sure I have the time or adequate patience for working with children. But I hear really good things about them as an organization and I’m very curious to learn more. So pleased to have found your blog. Original, thoughtful. I look forward to reading what you have to say about all sorts of stuff. And I only found you because I love the Fabric Store. What a lovely note this is! Thanks so much for stopping by, and for staying to read a while!